Survival is one of the most challenging and exciting genres of games. Whenever you hear the name of survival, you always know what to do – survive by eliminating everyone else. 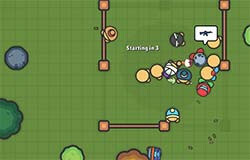 That’s exactly what Zombsroyale.io is. This is a survival arena very similar to Fortnite Battle Royale but packs the action and fun same to the original game. Zombs Battle Royale io is pretty hilarious and funny, to be honest. At first, you drop from a plane on the plane and start your journey. You can collect weapons, medical kits etc. from all around yourself. You don’t have any default weapon, only your bare hands. At the bottom-right corner, you’ll see your available gears. The right side will show your life. Just like Fortnite, the area shrinks after a certain amount of time to increase the conflict among players. There are several types of weapons like shotguns, machine guns, snipers etc. This game is still unblocked at school, so expect to have a lot of fun. The game is very simple to control. You have to move throughout the map, eliminate enemies, collect equipment and rule the kingdom! Whenever you drop from the plane, press “E” to deploy. While gliding down, you can hold “E” again for free fall. The real challenge is to survive throughout the chaos. At first, it’s really hard to understand the mechanics and survive the first few moments, but then, it’s all about mastering the weapons. At first, drop to some place where you see fewer players. That way, you have a better chance of survival at the first minutes. It’s crucial as when you drop, others will definitely try to eliminate you. There are supplies all around yourself. You have to have a sharp look for the supply crates. Next, it’s time for the weapon mastery. Each weapon type is unique. For example, the sniper is very good for ranged shots. Machineguns and shotguns are good for mob control. But I recommend mastering the sniper; it’s high damage weapon and heavily ranged. Then, it’s time for practicing your shooting. It will take time, but you can easily pull countless kills if your accuracy level is high enough. The view of the game is 2D (from upside), so there’s nothing involving crazy FPS skill. Keep a look for the shrinking circle. If you stay outside, you’ll get damaged and eventually, you’ll die. Heal yourself whenever you’re damaged or not taking any fire. Hiding in the bushes is a great way to stay hidden from your enemies or ambush for a sudden kill. Your enemies will drop their gears when they’re dead. If you’re lucky, you can get your hand on some of the most epic gears! However, each weapon has a limited number of bullets, so keep a sharp look at your ammo reserve. Ready to have the experience of Fortnite?